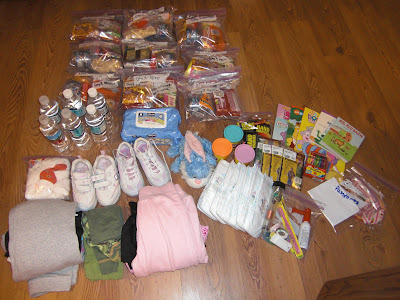 In my opinion, some of the best things you can pack for children are the exceedingly comforting and novel. Activities and Toys: Coloring books, crayons, stuffed animal, hair ribbons and rubber bands, and books. The play dough is novel and illegal at all times in our house. So this is huge treat. Callista kept trying to sneak off with it all day as I had the kits out. Clothing: I pack 3 sets of clothing. Clothing that can be slept in or worn. I have a pair of heavy sweats for each child, light weight thermals, and an athletic outfit. Everything is about 2 sizes too big. Plenty of room to grow but easy to roll. I also include a pair of sturdy shoes. I try desperately to stay away from "light-ups" on a regular basis but think they are brilliant for the kits. I pack 9 diapers and a whole pack of wipees. The girls have 3 changes of underwear and socks and toothbrushes. They also have a copy of their passports and birth certificates in their bag. We carry the medical equipment, cash, and other documents in Brent and I's bags. I will post about those later.